And why are some trying to attract him with musky, woodsy scents? If you have a single American (or Canadian) bone in your body, you know with total conviction that Bigfoot exists. Maybe you prefer the term Sasquatch. Maybe you think there’s a whole species of the bipedal cryptid, not just a lone representative. In any event, it must be acknowledged that Bigfoot is real, and strong, and maybe our friend. With the understanding that Bigfoot is out there, we can make some other basic assumptions: He has a specific diet. He sleeps and shits in appointed areas. He can probably make some interesting sounds. Most importantly, he gives off a particular scent. In a tautological way, it could be argued that Bigfoot smells like Bigfoot and nothing else. But that doesn’t tell us much. We need an olfactory investigation. This is my takeaway from an article in the Charlotte Observer about Allie Megan Webb, a North Carolina woman who has invented “Bigfoot Juice,” a kitchen-made spray that allegedly attracts “any Bigfoot within a mile and a half.” Although it was originally sold at $7 a bottle and is now going for $12 through Webb’s Facebook store, Happy Body Care, I choose to believe that this is not a novelty scam. As Webb pointed out to the Observer when asked how she knows the product works, “I guess I could ask how do you know it doesn’t work?” This circular logic is the essence of every great modern innovation. That something different could be elements of the less “feminine” bug spray Webb was concocting for her husband when she stumbled upon the Bigfoot formula; she had worked to create “a more musky, outdoors smell” for the insect repellent he wore on his Bigfoot-finding expeditions with other locals. Soon after, the group reported a sighting. 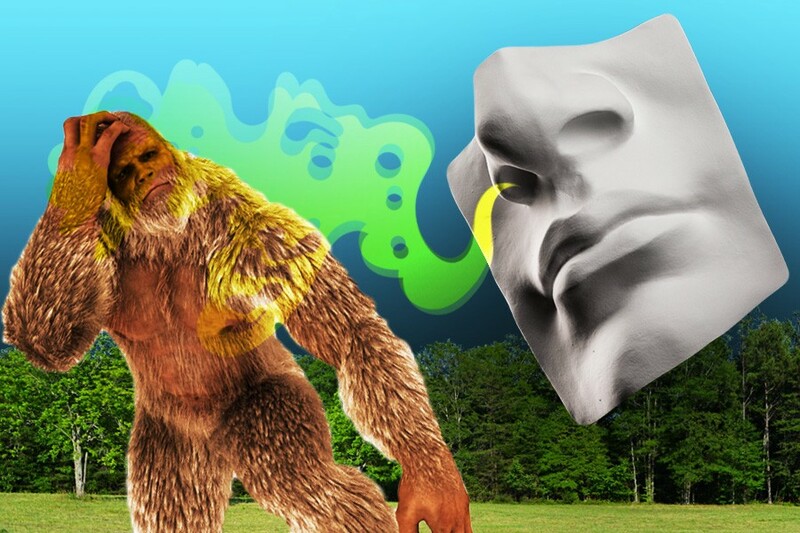 Are we to assume, then, that a Bigfoot is attracted to this forest-y melange of odors because it smells like another Bigfoot? Definitely not. If Webb’s husband is willingly putting this stuff on himself, I bet it carries rather pleasant earthy notes. The accounts of Bigfoot witnesses, by comparison, tend to agree that the creature smells terrible. The hunters of Animal Planet’s Finding Bigfoot, for example, say that “about 10 or 15 percent of witnesses report a smell associated with Sasquatches; a lot of times it’s described as ‘rotting meat.’” Just watching them get a whiff of their quarry is enough to make you a little nauseated. “The smell of death is in the air,” one of them reports. The good doctor, unlike our Redditor, insists that the Bigfoot stench can be “unbearable and overpowering,” like “being wrapped in dirty diapers,” but lends credence to the idea that the beast controls this via axillary organs in the armpits. It may secrete a fluid that gives off the odor when fleeing potential predators or preparing to confront one — a kind of adrenal fight-or-flight response. Nonetheless, the stink lingers. “A sample of purported Sasquatch bedding material that I smelled reminded me of preputial gland aroma (penile glands under the foreskin),” Fehrenbach claims, “a smell that would most certainly be perceived as ‘gagging’ in any concentration.” Nobody said field research was fun. So how do we reconcile Bigfoot’s appalling musk with its interest in Webb’s Bigfoot Juice, which is inoffensive enough to wear for an evening of cryptozoological investigation? I’m of the opinion that, like humans, Bigfoot is a hominid intelligent enough to be repulsed by its own foul emanations. Just because it smells to high heaven doesn’t mean it likes going around spreading a fetid tang of decay. Webb’s signature scent is akin to an intoxicant — the promise of a pleasing fragrance that may cancel out Bigfoot’s own malodorous bouquet. Therefore, I would advise her to leave an entire bottle of Bigfoot Juice out in the woods, unattended, but where observers can wait and see if a Bigfoot approaches, picks it up, and applies it to their fur as cologne. In which case she will have made the single greatest leap in Bigfoot science to date, confirming that our legends are true — and that anyone can get a little self-conscious.